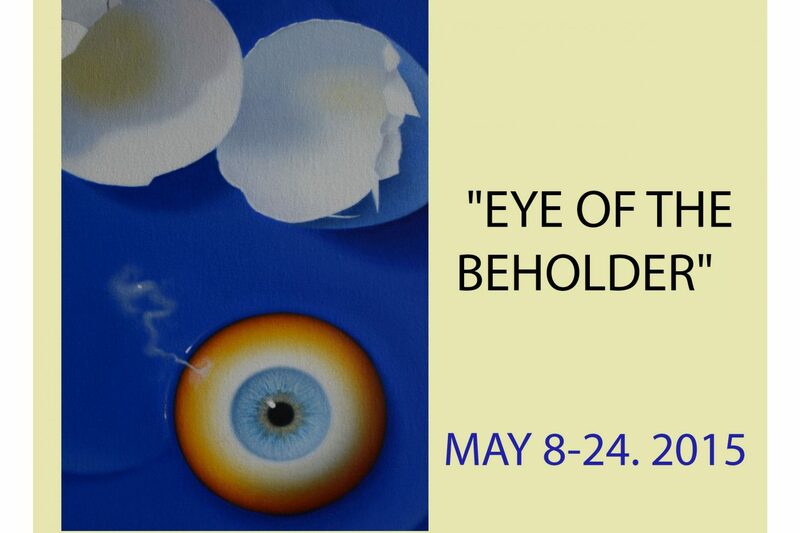 “Eye of the Beholder” is the show that puts to a test the concept of the French philosopher Maurice Merleau-Ponty about the way the viewers affect perceptions of paintings. This is particularly true in regard to Andrew Charyna’s art. The spectators can simply glide over the surface of the pictures getting sophisticated plays of light and shadows, juxtaposition of bright and dark colors or look at them until complete immersion into rich multilayered fabric of textures and hues form. Charyna comes from the prominent family of artists, poets, political and cultural activists: his great grandfather Petro Cholodny the Elder and grandfather Petro Cholodny the Younger are very important in the history of Ukrainian art. He knows his great grandfather from family memoirs, especially his mother’s – Ida Cholodny-Charyna -, publications and the few art works which escaped destruction. One of the most important aspects of Cholodny the Elder’s art is his interest in the history of ancient Ukraine. The Kyivan Rus period in Ukrainian history is largely ignored by our artists, leaving it unattended and available for Russian artists and authors to explore. Kholodny the Elder’s paintings on Kyivan Rus are not just great art, but a reminder to pay attention to this important period in Ukrainian state building. With his grandfather he had a relationship that inspired him and enriched his life. 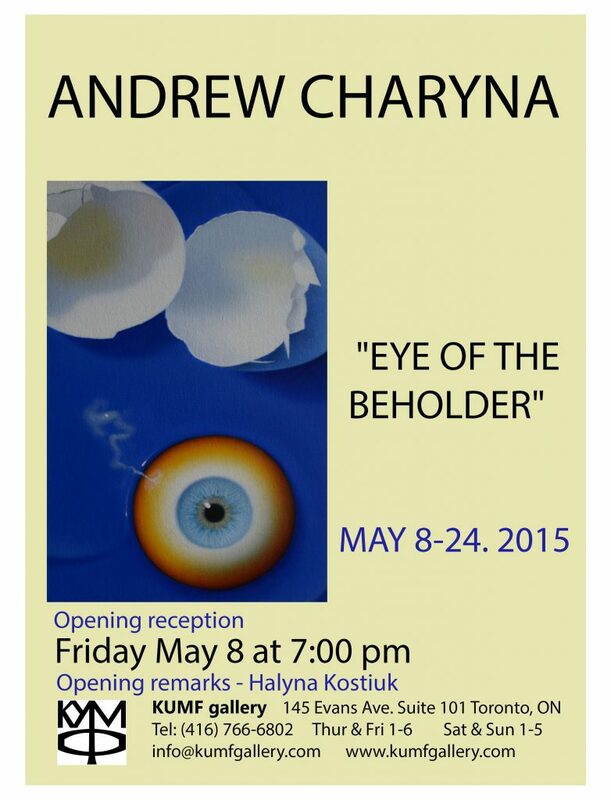 Charyna’s childhood was imbued with vivid impressions from his grandfather’s art and their relationships. There has been, of course, family affection on both sides, but it is the aesthetic, artistic relationship that Charyna treasures most. Being in grangfather’s studio, seeing him painting has proved inspirational for Charyna. As a little boy he hung on every word his grandfather was saying. Cholodny the Younger emphasized the importance of harmony when all the elements of painting come together like in the piece of music and the lines, patches of color coordinate like musical rhythm. He noticed his grandson’s interest in art and supported him. Once he took a picture of the then seven years old Charyna while drawing. The intensity of the little boy’s concentration matches the one of Cholodny himself in the starkly similar photograph. Charyna’s family has moved to Canada in 1968 and then Andrew could see his grandfather only during his visits to Toronto. At the age of 18, Andrew painted an icon, which his grandfather admired and took to a New York’s art show, where it was noticed by Cardinal Joseph Slipyj. The Cardinal wanted to buy the icon, but Charyna wouldn’t sell. A few years later Cholodny the Younger came to Toronto to show his grandson how to work with tempera. He brought gold, pigments and showed how to prepare a board. Sometimes they went fishing together and Andrew watched his grandfather make sketches en plain air. Cholodny the Younger taught his grandson that in icon painting it is important to keep things uncomplicated, not to overload the picture with details, textures and dimensions. If an artist uses simple planes, then the colors come out vivid, saturated, more pronounced. In 2001 the show “Three Generations of Cholodny Artists” took place in New York’s Ukrainian Museum. Self-portraits are an important part of Charyna’s body of work. They not only show his self-examination and self-reflection, but serve as an entrance to the place where the viewers become privy to the tenor of the relationship between the artist and the world, to the most intimate moments of thoughts and meditation; those paintings allow us to glimpse the artist’s doubts and hopes, deepest feelings which he is reluctant to reveal in other ways. His self-portrait as a young man in a Renaissance style shows his fascination with Albrecht Durer, who was one of the first artists exploring their own images throughout their careers. In 1498 Durer has painted a self-portrait in a very graphic fashion with fine details – one of the prominent features of his style. Charyna’s self-portrait executed in a similar manner: fine delicate details, three-quarter view, head turned in half-profile to the right, while the eyes intently looking to the left. Both men are of the same age, look alike, and seem to be engrossed in the same concerns as artists and human beings. The things Charyna chooses to depict are most unremarkable – objects that surround us and go unnoticed even as we use them – fruits, plants, light-bulbs, umbrella, dishes, boxes, etc. What’s incredible is the way the artist sees them through his painting. His unwavering gaze is fixed on everyday objects long enough for them to reveal their pure aesthetic non-representational appeal. In “Lemon” centripetal structure draws the viewers’ eyes into the depth of the painting with gravitational strength and holds attention. The viewers are mesmerized as their gaze is drawn to the limitless length of the painting that seemingly oversteps the boundaries of the frame, and they become completely absorbed y the process of penetrating visually the surface of the painting shade by shade until one is swallowed by it entirely. Such unwavering attention to color pulls out the subtlest nuances and complex interactions among the hues. The artist produces the painting which engages the viewer intimately and enhances the simple act of looking into a complex and richly nuanced relationship with the painting. Charyna painted “Between the Dead and a Sleeping” in his friend’s place. He included the elements of interior design in his still life: ceramic mask on a wall, purple bottle, and in the centre – an aloe plant dominates both composition and the palette. In this painting the entire spectrum of green plays harmoniously with other colors. The filiation of all shades of green is very diverse and rich – from the coldest almost transparent to the warmest, deep nearly black hues – the is an entire range of green, that pulses, rolls, vibrates. The artist juxtaposes dense heavy application of dark green and light, to the more thin and transparent background. The colors in this panting are affiliated with green hues, they complement and emphasize each other. “When the Silence Drowns the Screams” was inspired by a song. The artist applied the paint with a palette knife. In this painting he explores everything the blue can offer. Despite the heaviness, deep and rich blue has at the same time the fluid quality to it, producing the vivid cense of lively movement and undercurrent energy. Blue in his work is not merely a background, but an “equal partner” of other elements of the painting. Moreover, it steps into foreground and gets noticed first. To a certain degree the blue dominates the composition. The eye concentrates on tones, tints, delicate transitions from lighter spots to darker, plunges into the limitless depth of dense blue and contemplates on its intensity. Suspended in the sea of blue, the ears float, yet keep the balance and parallel position to each other, signaling the cense of order and harmony even in a state of deep distress. Charyna has got numerous awards: Best acrylic golden paints for “Peeled Apple with Knife” (2004), “The Crow’s Song” (1990), Best people’s choice for “Umbrella” to name just a few.